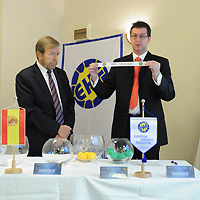 The draw for Qualification Europe took place on 03 July 2011 in Brno (CZE). Furthermore, the three best ranked teams from EHF EURO 2012 in Serbia (15 to 29 January 2012) are directly qualified for the 2013 Men's World Championship. All other teams participating at the final tournament of the EHF EURO 2012 in Serbia are automatically qualified for Play-Off Europe. Qualification Europe for the 2013 Men's World Championship in Spain will be carried out in two phases. The draw for Qualification Phase 1 took place on 03 July in Brno/CZE. The nine winners of the play-off matches will qualify for the final tournament of the 2013 Men's World Championship in Spain. The fixtures for Phase 2 – Play-Off Matches will be drawn on 29 January 2012 in Belgrade (SRB).